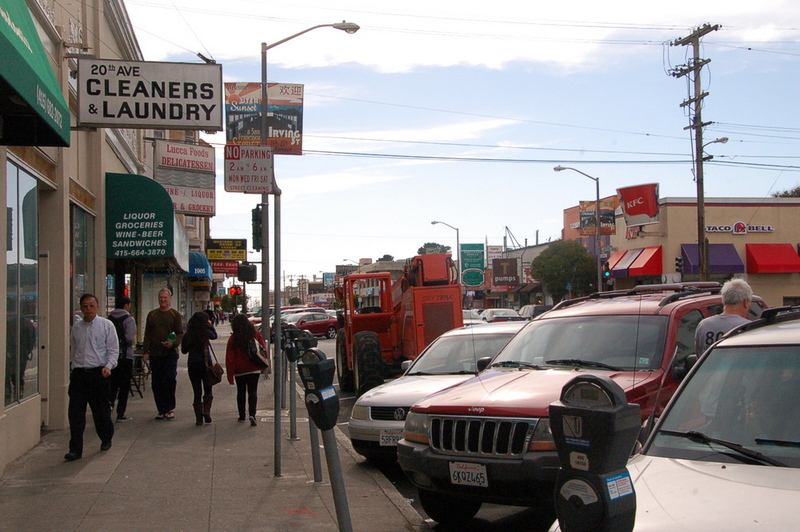 Most of the space on the busy commercial stretch of central Irving Street in the Sunset serves as a clogged parking lot, with rampant double parking and drivers circling the easternmost block to work around 19th Avenue’s left-turn bans. But while the car traffic and angled parking spots that eat up public space may not disappear any time soon, the Department of Public Works held a recent public meeting to field input on how to make the street more livable with new trees, re-paving, a median with greenery, and a few corner bulb-outs. Irving, between 19th and 27th Avenues, is slated to get the improvements using $3 million from the Prop B street improvement bond. However, planners said it likely won’t be enough for any significant sidewalk expansions. Sam Kaleh, owner of Lucca Foods at Irving and 20th Avenue, said crossing the street at the corner can be dangerous, and hopes to see crosswalks made more visible. He’s considering applying for a parklet in front of his store to provide more space for people than the narrow sidewalk currently provides, though he’d prefer a bulb-out because he’s concerned a parklet would invite homeless people to sit in it. (That’s a concern that prevails among some merchants and residents, even though it generally hasn’t been a real problem at the 38 parklets installed around the city.) “I’d like to see people be safe and happy about shopping on the street,” said Kaleh. Irving next to Lucca Foods. As the flattest east-west street in the northern Sunset, the site of many retail businesses, and a connection to Golden Gate Park, Irving is also popular among bicycle riders who are willing to squeeze through the traffic. 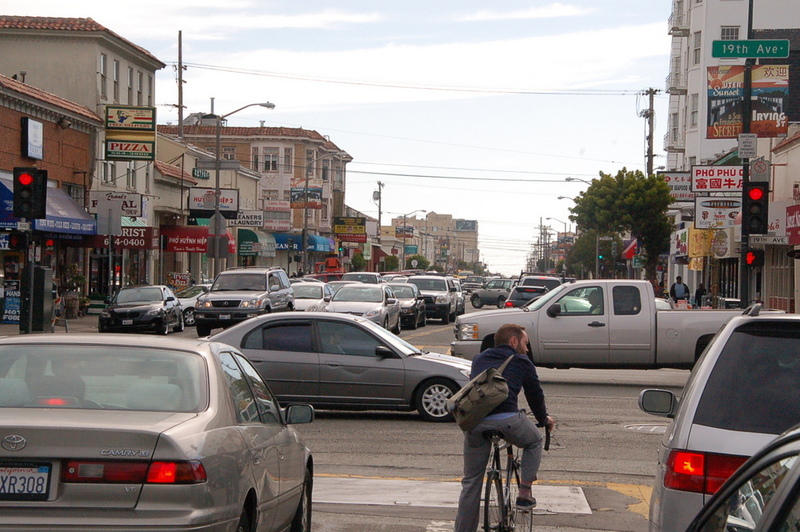 Providing safer bicycling conditions could help grow the number of people shopping by bike. DPW plans to present proposed improvements for the street at a meeting to be scheduled in the coming months, with a final plan developed by next year. Construction on the project is set to take nearly a year and begin in February 2015. Streetsblog will be off tomorrow — happy Fourth of July, everyone. This neighborhood is one of the City’s best kept secrets. This plan will gentrify it. Please can we stop building medians? For the love of god, YES! I’ve seen so many bike lane and street calming projects get shot down or diluted because there “isn’t enough street width” due to the medians. Medians which were only installed in the first place to fill up the space where the trolley lines that GM ripped out used to be. If they want to add greenery do it next to the sidewalk where people can actually enjoy it, as opposed to out in the middle of the street where it benefits no one and just hampers sight lines and encourages speeding. The only good median is a short pedestrian island in the middle of a crosswalk at a wide intersection. All other medians should die quickly. Homeless people are one of the least concerns facing the Sunset! Don’t foresee that adding a parklet would suddenly entice them over here. The author has tunnel vision. This section of Irving St. has heavy pedestrian, vehicle traffic while few bicyclists. Customers like to shop, merchants provide the items and services. A win-win situation. The article does not say who is complaining with the current layout: customers or merchants. Safety for everyone is very important. From 21st-26th Ave. every intersection has a painted crosswalk and 4 way stop sign. 19th & 20th Ave. have traffic lights. How does the author wish to improve bicycle safety? There isn’t much road space to add a bike lane and 3 ft buffer. Would it be better to remove street parking and install a bike lane for the few bicyclists? Don’t think the merchants and customers would like that suggestion. Planting more trees on the sidewalk would make the area greener. There is no room for cement medians. Largely agree. 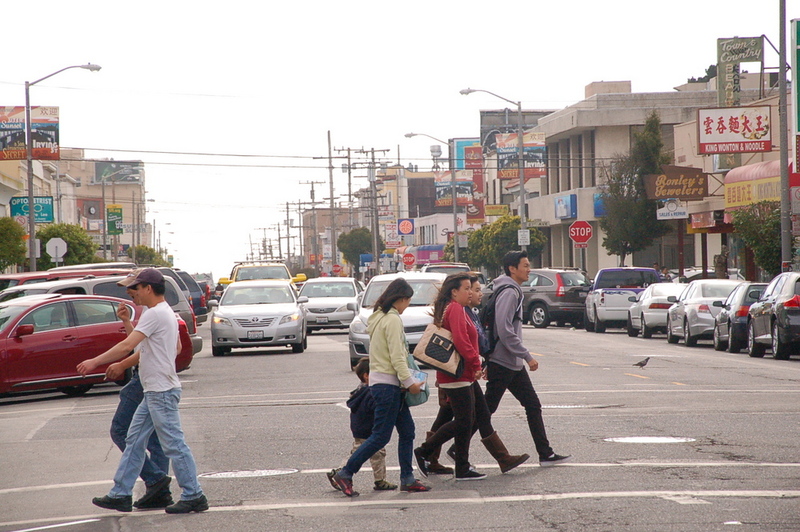 Exception: very wide streets where a median provides a halfway refuge for those crossing on foot. Of course, the ultimate solution is not having expansive pavement cutting through highly-populated urban areas at all. If the street is so wide it needs a median for ped crossings, you are doing it wrong. Also, Irving is not that street. I’ve been saying this for years, what our neighborhood really needs are some parking permits. And trees. And a bike lane. If DPW has anything to do with it, it will be worse than it is now. I’m not sure how considering alternatives to the status quo qualifies as tunnel vision. Perhaps a perceived lack of cyclists today is due to the street’s current design and a streetscape that discourages many from cycling? If done right, improvements to this stretch of Irving Street could encourage more shoppers (and employees) to travel by bicycle, lessening traffic congestion and local air and noise pollution while likely decreasing the pedestrian and bicyclist injury rate (and decreasing the demand for automobile parking). The article is about narrow interests. People from 7-77 years of age have many places to visit on this part of Irving St.: banks, hair salons, dry cleaners, restaurants, produce markets, delis, dentists,… I doubt there will be a reduced demand for parking. From your broad reply I’d say you are not familiar with the area. If you have specific improvements in mind, please describe them. How do you improve it without gentrifying? Tom, improvements will only increase demand in this neighborhood.They should be made along with increased housing that insures that those that have lived in the central sunset for multiple generations can continue to live in the neighborhood. Every major city has some wide streets. Denying it shows how one is not in reality. I agree with your first point. Irving Street is not a place to put a long median, but streets such as 19th Ave and Lincoln Way are certainly safer with a median. For the majority of the users of that thoroughfare, perhaps? Crossing six lanes of traffic then, as a pedestrian, a central refuge could be a lifesaver. At a time when some of the special rights due to race and gender are disappearing why do we tolerate the special rights to park on a particular street due to address? What is the logic of Residential Preferential Parking Permits beyond political pandering?